At Alan’s Factory Outlet, we have several metal carport styles available for purchase, including our regular-style carport. For each of our high-quality metal carports, kits are available that you can assembly yourself, but we also offer free delivery and setup of each carport we sell. Let us make the process of protecting your property hassle-free and affordable with our durable, customizable metal carports! A carport is the ideal way to provide coverage for your vehicles and protection against damage from the sun, rain, snow, and wind. A regular-roof carport, also known as a barn-style carport, serves the same purpose as a traditional garage but for a fraction of the price and with installation that takes a fraction of the time. The regular-style carports at Alan’s Factory Outlet are delivered and installed for free in 26 states plus the District of Columbia. These regular metal carports are available in AL, AR, AZ, CA, DC, FL, GA, IL, IN, KS, KY, LA, MD, MS, MO, NC, NJ, NM, NY, OH, OK, PA, SC, TN, TX, VA, and WV. Why Choose a Barn-Style Carport? There are several reasons why people choose our regular-style carport over our other carport styles. Most notably, the regular-style carports are the only style of carport with a barn-style roof. There are many roof types, but the barn-style roof, also called a gambrel roof, is one of the most popular in the United States. 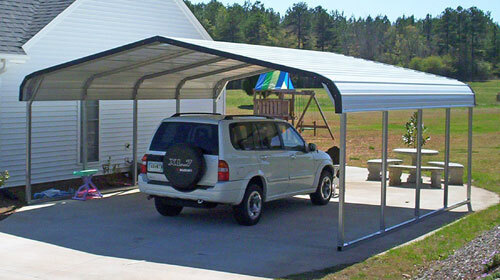 These regular carports also save money, as they cost less than a boxed-eave or vertical-roof carport. These regular-style carports can be designed for one, two, or three cars. Choose from many sizes to find the right regular-roof carport for your needs. Need more height? Our metal carports for sale can be raised in 1-foot increments up to 16 feet. You can also fully or partially enclose regular-style metal carports to give yourself more coverage and a better sense of security. If you’re not certain whether you want an open or enclosed carport, there’s no need to make a hasty decision: You can always enclose your regular-roof carport at a later time if desired. When you buy one of our metal carport kits, you’ll get the best carport prices online: We work hard to provide a great value to every customer we serve. The prices of our metal carports for sale can vary according to where you live; differences in the prices of metal carports’ kits are due to the cost of additional labor and materials to comply with state regulations or suit local weather conditions. Check out the prices for your state when you are ready to order your regular metal carport from Alan’s Factory Outlet. This regular style metal carport is anchored to asphalt. Metal carport with optional j-trim. Carport shown with optional gables on both ends. Last 10' of the end closed with a garage door and right side closed. Regular carport with options of taller 12' legs and option of one side closed. Steel carport with optional taller legs and option of both sides partially closed. Regular carport with two gables and both sides partially closed. Regular style carport vs the boxed eave carport and the vertical roof style carport. Is a Permit Required for a Metal Carport? In most cases, metal carports do require a permit, but this will vary depending on your local zoning laws. Do I Need a Permit for a Freestanding Carport? Usually, you will need a permit whether your carport will be freestanding or attached to an existing structure. Check local zoning laws to be sure that you’re in compliance before you build. What Are Carports Made Of? Our carports are made of durable steel. These steel buildings are sturdy and look great in many settings, and they come in a range of colors.